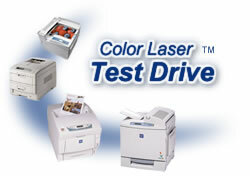 Everyone knows that a color laser printer is a big investment. A wrong decision here could cost you thousands. In some cases you can't return a color laser and if you could, it would cost a small fortune due to their size and weight. Let's face it, you wouldn't buy a car without a test-drive. Now you can evaluate several of the top color laser printers for yourself even if you don't visit our showroom. We take your file(s) and print it on the printers you want to test-drive. We then send you the results. It's that simple. Now, for as low as $19.95 you can compare up to three color laser printers, (three pages each), and see exactly what the difference may be from one printer to the other before you buy. Your file, not a manufacturer's optimized sample test demo, is the measuring stick. Judge the print quality for yourself. We have the latest and greatest color laser printers on live display already in our showroom from manufacturers like HP, Xerox, Lexmark, Kyocera, Ricoh, and Okidata. You choose which printers to test and our printer experts will send your print samples to you. Additional printers are only $5.00 each. You may email your file(s) directly to webmaster@printershowcase.com (as long as your attachments total less than 20MB). Or you may send us your larger files via www.wetransfer.com or other similar free file sharing service. Which printers do you wish to test?